Bruce Maxwell has just opened himself into a world of hurt! My fear of this nonsense spreading to my favorite sport, baseball, has come true. 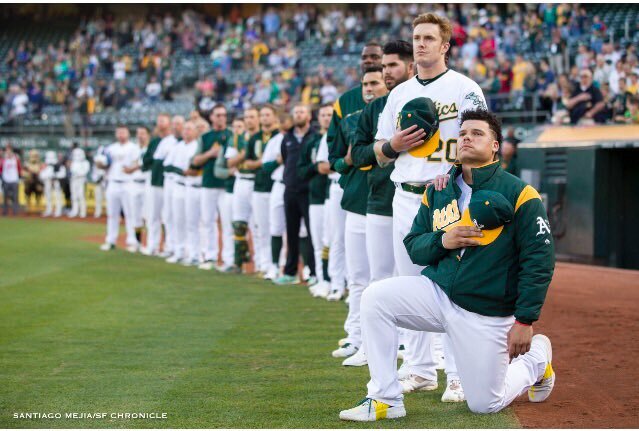 The Bleacher Report reports Oakland A's catcher Bruce Maxwell became the first Major League Baseball player to kneel during the national anthem, according to the San Francisco Chronicle's Susan Slusser. "The Oakland A's pride ourselves on being inclusive," the team said in a statement. "We respect and support all of our players' constitutional rights and freedom of expression." Manager Bob Melvin said Maxwell told the team before the game that he intended to kneel, per Jane Lee of MLB.com. Melvin added Maxwell thought long and hard about doing this, per Lee. Never fear! This will drive many more hive dwellers into the stadia to support these fine examples of humanity.